She wears glasses like yours – with thick black ear pieces and silver hinges that bend both ways. Her hair is long and dark, but broken with streaks of amber that shine quietly like yours did when the light bent the right way. Her laugh is different, but she laughs at the same jokes I used to tell you and squeezes my arm to steady herself when I’m particularly funny. I met her at a coffee shop, where she may have ordered your favorite drink. I say she may have ordered your favorite drink because no matter how late I stay awake each night, or how many times I read through the menu at Starbucks, I can’t remember what you ordered the last time I saw you. 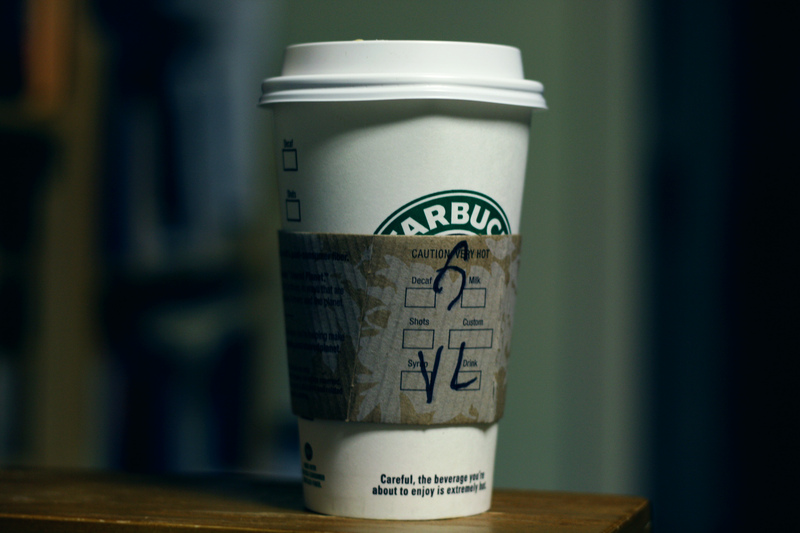 She ordered a vanilla latte with cinnamon sprinkled on the top – is that your favorite? The man behind the counter announced her name when the latte was ready, but his voice was unsure and ended in a question mark. I asked, “He isn’t saying that right, is he?” “No,” she said, “and they didn’t spell it right on my cup, either.” Nobody ever spells your name wrong. There are things about her I don’t like. The first time we met for lunch, she ordered a Reuben sandwich without sauerkraut or dressing; that bothered me because without those things, it’s not a Reuben anymore. She doesn’t read the newspaper on the weekends, even when I offer it to her after I’m done. Even when I have sorted out all the grocery store advertisements and stock market listings and other parts I know don’t interest her. She also switches hands lots of times when she brushes her teeth, which didn’t bother me until I tried it and stabbed the top of my mouth while using my left hand. It felt bruised the rest of the day and stung when I pressed my tongue against it. I don’t remember how you brushed your teeth, but it never bothered me. Last night, we slept together for the first time. After a bottle of wine, we turned off the lights and took turns pressing each other into a mattress you never felt. In the dark, her hair doesn’t shine like yours and she doesn’t need to wear her glasses. Her breath does sound like yours as it speeds up and releases in bursts. I didn’t worry about the way she orders sandwiches anymore, because I don’t like crumbs in my sheets and our mouths were busy anyway. Near the end, I touched her leg and felt her wince as my fingers slid across the scab there. I was glad to feel her body tighten because she was real, and alive, and not a memory to be carried about in pockets and bags. I just remembered that your favorite drink was an Americano with foam, and that they made you very happy, and that you made me very happy. I hope she has that in common with you soon.